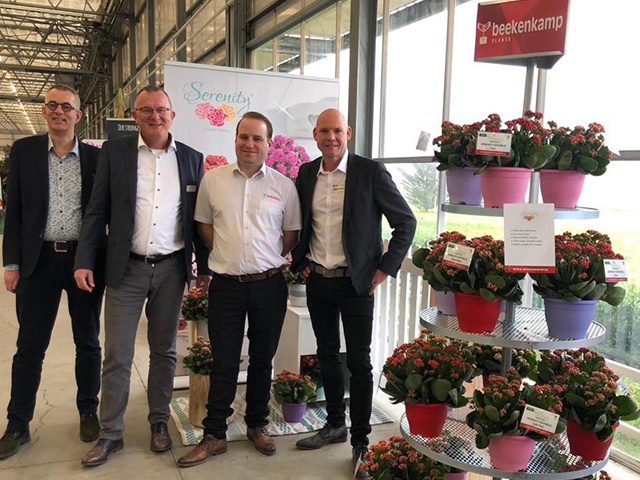 Beekenkamp Plants and SlijkermanKalanchoë have agreed to a cooperation effective immediately for the North American market. SlijkermanKalanchoë, a family owned company, specializes in the breeding and production of single and double flowered Kalanchoë. Beekenkamp Plants will offer exclusively the full line of the potted SlijkermanKalanchoë to the North American market. Production will be started at the main Beekenkamp location in Uganda in combination with the Begonia production. For the 2019-2020 season, production will be available out of the Slijkerman location in Kenya. Both the single and double flower Diamond series are uniform in habit and flowering and require minimal PGR. The Serenity series offers 15 colors which are completely uniform due to breeding by genetic mutation. The focus of breeding is on unique colors, flower size and shelf life. With this expansion, Beekenkamp Plants strengthens their position as a house plant supplier in the North American market.